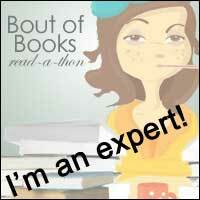 Fabulous Book Fiend: Culture Bite Books and The City events plus Giveaway! Culture Bite Books and The City events plus Giveaway! 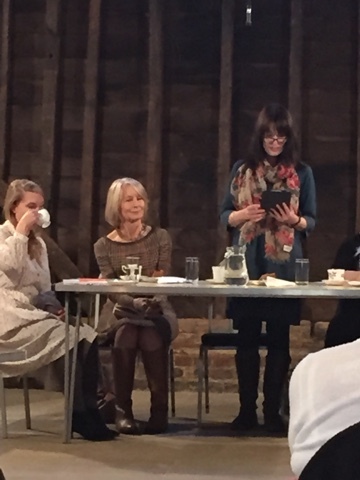 This weekend signalled two fabulous author events for me as part of the Wonderful Culture a bite festival organised by Hillingdon libraries! Take a look at the bottom for your chance to win one of the goody bags! 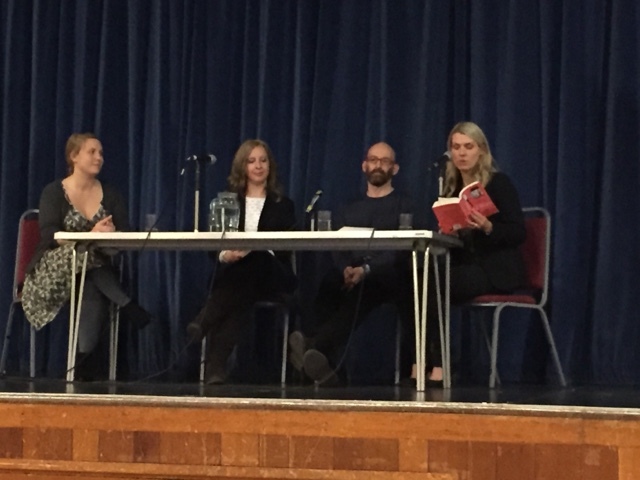 Both events included Books and The City authors from Simon and Schuster, Books and the a city being an awesome imprint and containing many of my favourite authors, the first of which involved Paige Toon, Jane Costello and Andy Jones. Both panels were chaired by fabulous S&S editor Clare Hey. 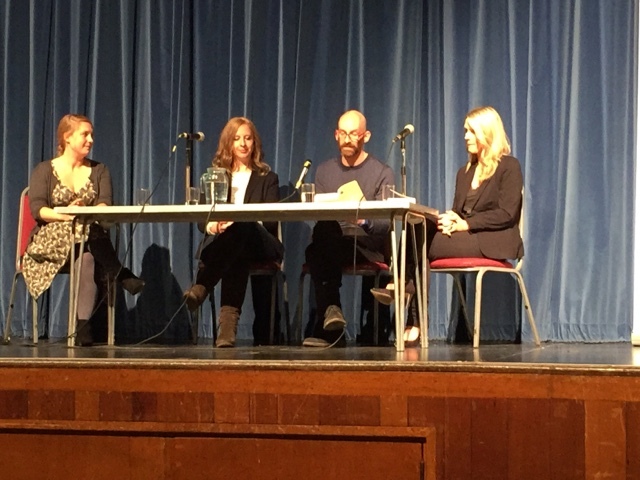 Each of the authors read a little of their novel and then answered some questions from Clare and from the audience. Andy read from his Novel The Two of Us which is a bitter sweet story told from the male point of view, which makes it really different and is a totally fresh prerspective in the commercial women's fiction market. Definitely, go back and check out my review of this one. He said that he would love to go on a date with Ivy, the main heroine in his novel but he was having trouble talking about his characters from this book because he had just finished working on book two, which was very exciting news! Paige read from her novel, The Sun in Her Eyes which I reviewed at the start of the summer. I read this book cover to cover, it was just so compelling. She talked about the fact that her character was a little bit naughty in this book and she was quite fun to write. She also talked about how she usually goes on location to research the Australian parts of her books but this one she wrote mainly from memory. She is currently working on her third YA novel although the one she is beginning to write for adults right now is Bridget's story which I am very very excited about because she is a secondary character that I loved, she also said that she would go on a date with Johnny from Johnny be Good/Baby Be Mine because she really really fancies him although she revealed a soft spot for Nathan who would definitely be my pick! At the end of the event we were treated to a goody bag (see picture below) and a glass of bubbly and the authors were around to sign our books. It was lovely to hear from them all again and if you haven't read their novels, they all come highly recommend! 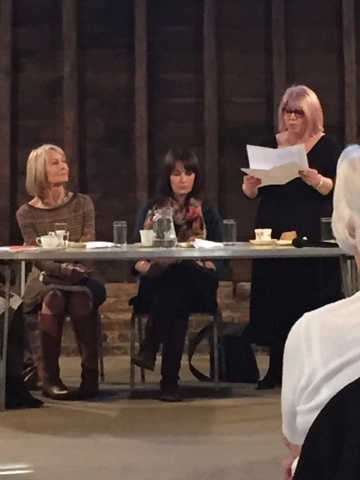 Event number two was an afternoon tea with Milly Johnson, Iona Grey and Sandra Howard. 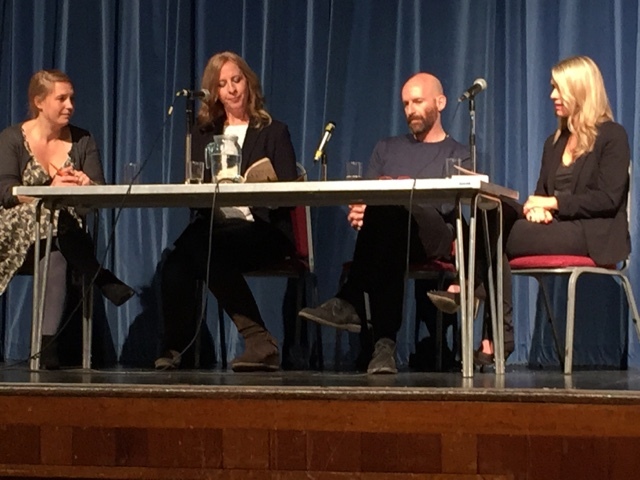 Again this event was chaired by Clare Hey and each of the authors read us an extract and then answered various questions. Milly Johnson read first. I always love hearing Milly read because hers is the voice I hear in my head when I am reading her novels and it's great to hear them in the proper Yorkshire accent, as they should be. Afternoon Tea at the Sunflower Cafe involves a bit of a love triangle, a cleaning firm and van Gough coming to Barnsley. Milly said she did a little bit of research to see whether it mentioned Van Gough coming to Barnsely in his visit to England but when she found out that it didn't say he didn't, she went ahead and put it in the book. She also let slip that her next novel is going to be set around animal shelters but that she is snuggling with the title of it! 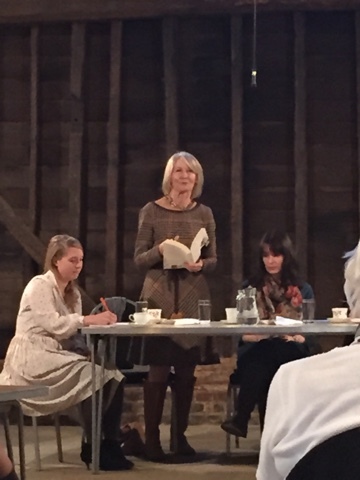 Iona Grey read us the heartbreaking letter at the start of her novel Letters from the Lost. This reminded me how much I loved that book and also how much I would love to read it again, maybe I'll see if I can get the audiobook! She talked about how she got the inspiration for her book by a house that appeared on homes under the hammer, no one could locate the owners and it was bringing down the neighbourhood and this is where the modern part of her story takes part. The historical side of the novel came from the stories her grandmothers would tell her. She said that she really did find it difficult writing about a housewife in the wartime who's main ambition was to cook and sew for her husband and have a family, but she really enjoyed being different from other books about women in the war who went out and battled for Britain despite their limitations. While she admitted that she didn't cry whilst writing the novel, she said with each emotional scene she got more and more tense and so she could feel that something big was brewing in the storyline, again do go back and and check my review of this, it's a bit gushy! Sandra Howard read a little bit next. In Tell the Girl, she writes partly about herself, it's semi-autobiographical. When I heard this, it made me want to read it all the more because she revealed that she had met a Frank Sinatratre, Kennedy and Marilyn Monroe! She had such wonderful stories to tell and said the inspiration for the title came from her time as a model when then photographer would tell the person running the shoot to tell the girl to do this or tell the girl to do that, never addressing the model. She agreed with Iona about the road of women historically and that women would not be treated like that today but back in the sixties, when she grew up, this was the norm and she didn't think anything of it. The book sounded fabulous and she said she thought of the title of her current work in progress even before putting pen to paper! And now comes the part where you can get involved. We each got a goody bag at the event and so I have three spare! 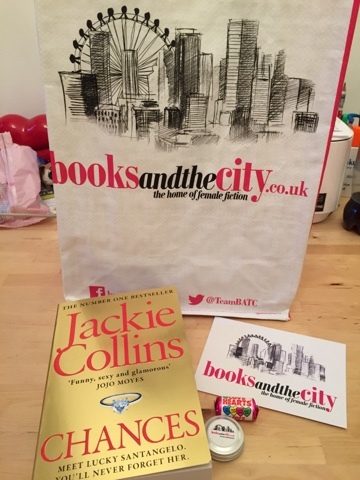 The bag is a brand new tote bag, you'll notice the change from the previous Books and the City Bags and it contains the first in the Sanangelos series by Jackie Collins with this gorgeous cover. You'll also get a books and the city lip balm and a pack of love hearts! Perfect days reading eating sweets I would say. Even though this is a monster of a book, I'm still going to open this up internationally and it'll close on Friday so I can get to the post office on the weekend! Just comment below or send me a tweet telling me who your favourite Books and the City author is! You can have a little look on their website if you need some inspiration, or perhaps it's one of those featured in this very post! Thanks to Simon and Schuster and Hillingdon Libraries for these Culture Bite events and good luck to all the entrants to the giveaway, I'll announce the winners at the weekend! I can't wait to visit you all one day! Hi C, thanx fir making in Intl, am writing from India. BATC definitely has one of my all time fav - Jackie Collins (RIP). Also, I recently got my 1st Milly Johnson book (Afternoon at the cake shop), her books have always caught my eyes and have such aa cosy, heartwarming vibe tothem. Another author I am looking forward to read is Iona Grey - Letter to Lost sounds like a teary eye read. Forgive the typos, writing on mobile.